← Rebuttal: Do You Really Believe So Jim? A lot of time when it comes to obstacles you’ll want an obstacle with certain characteristics beyond what a normal obstacle would have. You might tailor it to deter a specific threat or take advantage of your existing resources. During this entry we’ll look at a couple of the common places we may not necessarily want to completely cut off 24/7 and examine a few methods of creating a temporary barrier that can be moved into and out of position. One thing you might have noticed is how I started the obstacles piece in kind of a remote area and have been working it “in” towards the homestead. This entry will put us right into the immediate area around the homestead – literally almost in the front yard. 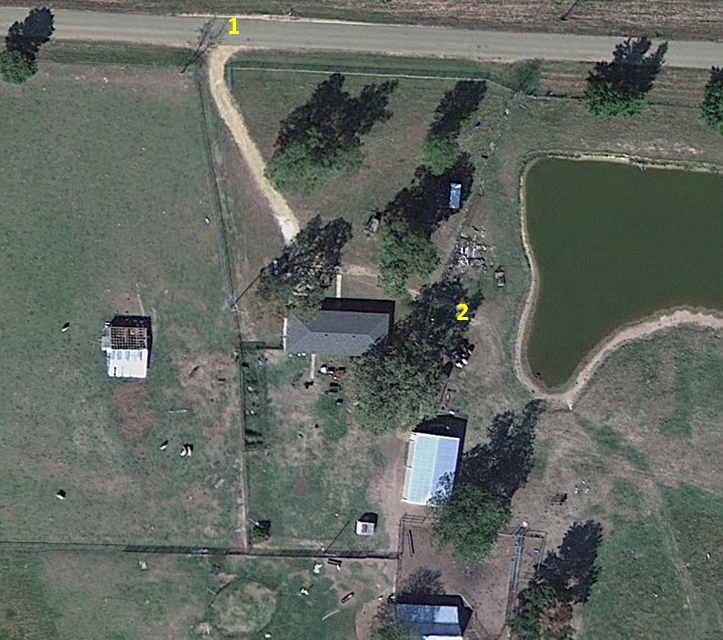 The acre or two immediately surrounding the house and barns (what I’m going to refer to as our “point defense”) is going to be the focus of this entry as we look at ways to reinforce that portion of our area of operations. Now most of y’all probably don’t want to close off access permanently to the house (especially if you’re still interacting with your other tribe members) but you still want to have some kind of measure of deterrence when normal folks aren’t out and about. Now notice that I’ve marked two areas in the pic. Area 1 is our entry to the driveway. Also for the sake of examination I’m going to say the fence line at area 2 has a cattleguard. Let’s tackle that driveway opening first. It’s an open area roughly 15 feet wide with a barbwire fence on either side. If we’ve done our homework and reinforced that fences that driveway is a natural route for a threat to take as they are channeled by our other obstacles. But it also leads directly to the house and that is something we darn sure don’t want. As it currently stands it’s a high speed approach for both dismounted threats and vehicles. We gotta fix that so what we need is an obstacle that we can move into and out of position that will deter people on foot and vehicles from entering. To do both effectively we’re going to need a complex obstacle – that is an obstacle made up of more than one element. And it’s gotta be somewhat easy to emplace and remove on a daily basis. The first thing we could do is create a slalom down that driveway with some more fencing and barriers. That will help to slow down any vehicle that enters the homestead when our other barriers aren’t in place. I want to tackle vehicle barriers first. Why? because although a vehicle may not be able to make it all of the way to the house they can ram into fences opening them thereby giving dismounts a faster method of approach. Now we need to be realistic here. You’re going to be hard pressed to stop anything really heavy (i.e. a tank, IFV, etc.) but for most wheeled vehicles we can slow them down or prevent their ingress with a few simple measures. First up going back to the entry about stopping the threat on roads and trails I’m going to borrow an obstacle design and modify it a bit. Looking at the obstacle that’s a pole in the road we’re going to create a variation of it that we can install and remove with nothing more than a lift on a tractor. 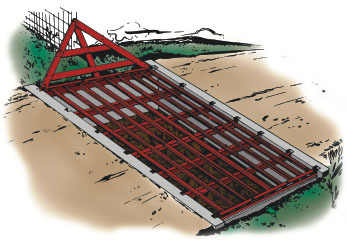 For this method you’re really going to want to use concrete as a base for the obstacle because if you just emplace these in normal dirt they’re going to be pushed over a lot easier. Anyhow you’ll need to find some sections of pipe that has roughly between 6 and 8 inches of inner diameter – PVC will work for this but it won’t be as durable. Excavate a a ditch approximately 3 feet wide and 12 inches deep across the drive you want to block. Then you’ll take your pipe and cut it into sections 3 feet long. Dig it into the ground in a pattern as indicated in the pic below making sure that it’s 24 inches below the level of your ditch – 3 feet into the ground and flush with the regular surface and no more than five feet apart in a line. Preferably you’ll be able to create two staggered lines so when it’s setup there’ll be no more than 2 and a half feet between each post when looking from the front. Then you’ll need to create a form to pour your concrete in and once you’ve got that done you’ll want to use rebar both horizontally and vertically driven into the ground tied together to form a support matrix for your pour. When you pour the concrete make sure you put a few inches in the bottom of the pipes as well to support the poles. And once that part is done it’s time to turn to the poles/posts themselves. Some of the best and cheapest material to use on this step is railroad rail. You can find it in scrap yards and sometimes even on the internet (I managed to snag a hundred feet on Craigslist pretty cheap). But in a pinch you can also use regular metal pipe or even PVC pipes capped on the bottom. If you use a hollow pipe then you’re going to want to reinforce it by filling it with rebar and concrete. On top of the posts you’ll want some kind of loop or hook to be able to lift them to remove and install them. Something like a wire cable and clamp or a shackle will work. Also you’ll want a loop or hole to be able to run wire cable through at roughly the middle of the exposed parts. Anyway these should still be light enough that you can lift them with the forks on the front of a tractor or bobcat. Assembly is pretty simple – in the evening drop them in place and run a wire cable through the top and middle loops. That cable will help add to the strength of the entire assembly. It’s preferable to alternate how you run that cable – i.e. weave it at the top and run it linear at the bottom. Here’s an example. Will it stop a bulldozer? No. Will it stop a jeep, pickup, or HMMWV? Yes. Will it stop an ASV or MRAP? It depends. 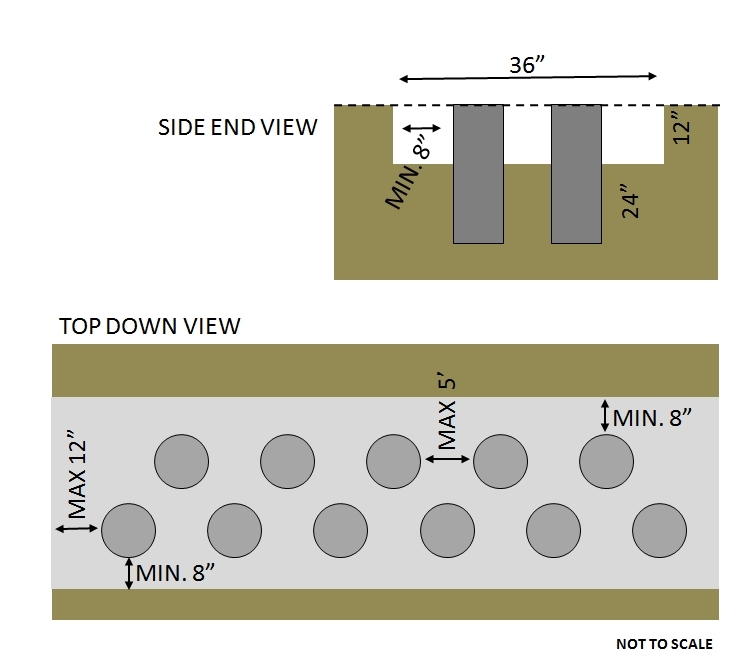 If the area on the threat side of the obstacle is gravel or soft dirt then it probably will present enough resistance that when those vehicles push against it their back tires will probably spin and start digging in. But remember – obstacles only deter a threat and they won’t stop a determined and capable threat. So we now have an obstacle that will deter vehicles. However we still have to deal with dismounts. And the best deterrent for dismounts is good old wire (razor wire works best). But we need a setup that will allow us to block and open an area at will. 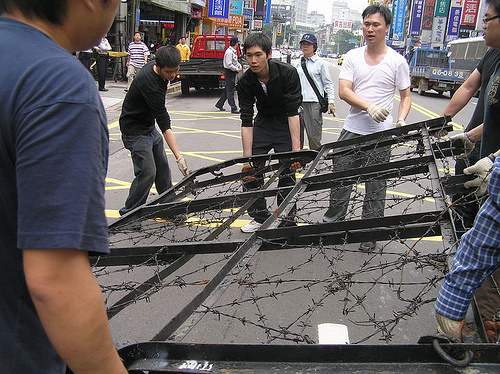 So for this effort we’re going to build a frame to hold our wire that we can pull or lift into and out of position. It needs to be fairly sturdy and not be movable by hand. What I’ve come up with is a setup that should be pretty cheap and easy to build and still fairly quick to emplace and take down. This type of obstacle is effective only when there are no gaps between it and the fences. 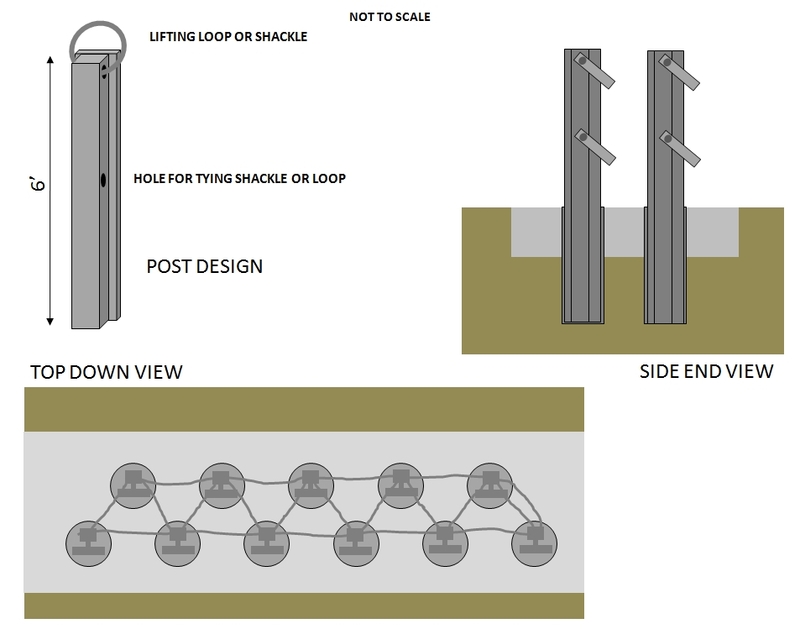 IMHO being able to lift the entire assembly and push it up against the existing fences at the opening will not only add to the security but will also add to the durability of the obstacle versus being drug into place. You want to make sure that this kind of obstacle is wider than the fence opening it is supposed to close. Pay particular attention to the area where the existing fences and the obstacle meet. 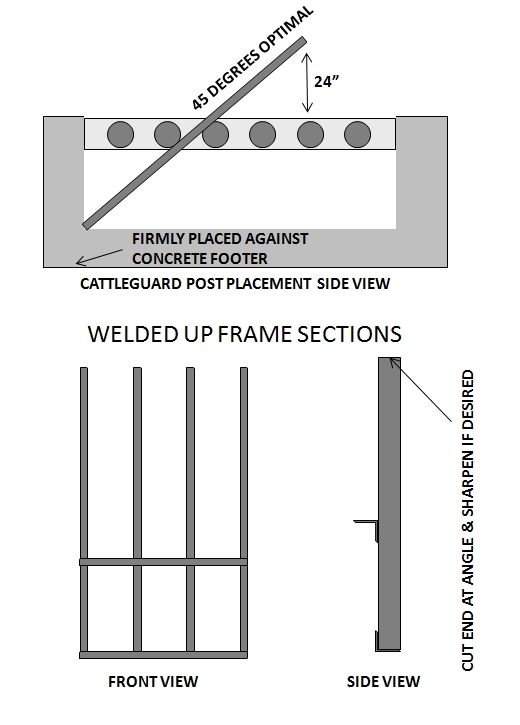 Don’t get hung up on the main frame design – just make sure you focus on structural rigidity and weight. 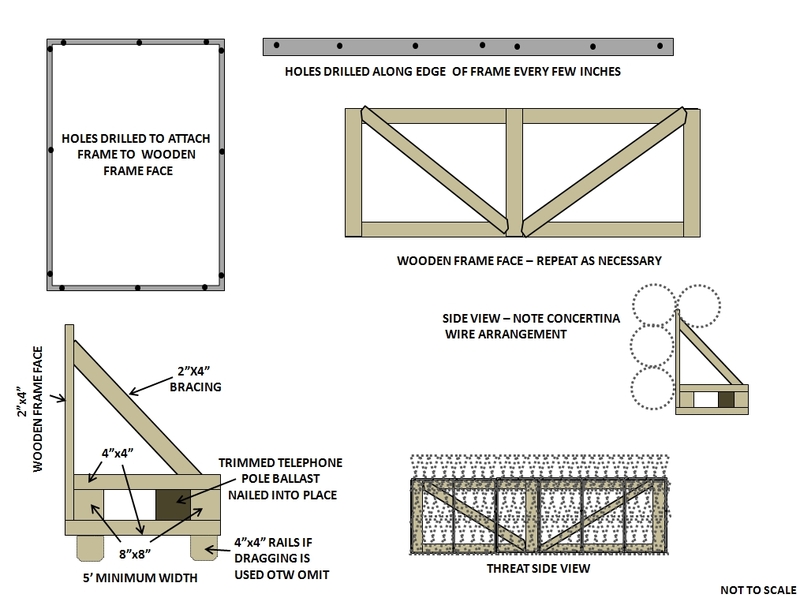 Adding spiked boards and nails to the facing frame on the threat side will also help deter people from trying to engage it. These two obstacles combined can be emplaced with a tractor lift in under a half hour (putting the posts in place is the most time consuming task and that becomes easier with experience). They should be a great enough deterrent that the threat will focus their efforts on another part of your obstacle. Anyhow be creative when designing this kind of obstacle. Not too long ago in a discussion about obstacles I was asked if cattle panel would work for this. IMHO I wouldn’t use it because the pipes running across it are rigid enough to support the weight of a climber. What you should end up with is an obstacle that can be emplaced by hand is a short amount of time. You can stack these so you have multiple layers on the same cattleguard as well. Granted this isn’t going to completely stop a vehicle but anything with a suspension or driveline within 24 inches of the ground is going to suffer catastrophic damage and isn’t going to go much further. I have seen this type of obstacle completely destroy a U-joint and pierce an oil pan. The examples given are just a couple of types of obstacles that serve a specific purpose. On my last road trip my host asked what I thought about making concrete beams out of forms dug into the ground with construction wire (the heavy gauge stuff) reinforcing it. This is the kind of creative thinking you can use to reduce the costs in time and resources and still create viable and effective solutions. Don’t for a second think that this series has presented every type of obstacle – that would take volumes upon volumes. What I have tried to do is show some examples of how you can leverage existing resources to your advantage when it comes to creating and emplacing obstacles. Over the next few entries we’re going to be going back to the map and developing an obstacle plan for our AO to deter different types of threats. We’ll be using some the obstacles I’ve presented and examine the logic behind what goes where and possibly when. Even better IMHO would be a type that would lie flat and pop up via some sort of mechanical system. In other words, steel poles do to the vehicle what Mel Gibson’s poles did to the English Cavalry in Braveheart… Present what appears to be an open gate and… Shut it down by impaling the first vehicle in the attacking force!